What is database or database management systems (DBMS)? and – What’s the difference between file and database? Can files qualify as a database? Database provides a systematic and organized way of storing, managing and retrieving from collection of logically related information. Secondly the information has to be persistent, that means even after the application is closed the information should be persisted. Finally it should provide an independent way of accessing data and should not be dependent on the application to access the information. Main difference between a simple file and database that database has independent way (SQL) of accessing information while simple files do not File meets the storing, managing and retrieving part of a database but not the independent way of accessing data. Many experienced programmers think that the main difference is that file cannot provide multi-user capabilities which a DBMS provides. But if we look at some old COBOL and C programs where file where the only means of storing data, we can see functionalities like locking, multi-user etc provided very efficiently. In flat files we have to parse and know exact location of field values. But if a DBMS is truly RDBMS you can access the value by specifying the table name, field name, for instance Customers.Fields [‘Customer Name’]. “Null values (distinct from the empty character string or a string of blank characters and distinct from zero or any other number) are supported in fully relational DBMS for representing missing information and inapplicable information in a systematic way, independent of data type.”. “The data base description is represented at the logical level in the same way as ordinary data, so that authorized users can apply the same relational language to its interrogation as they apply to the regular data.”The Data Dictionary is held within the RDBMS, thus there is no-need for off-line volumes to tell you the structure of the database. Rule 9: Logical data independence. “Integrity constraints specific to a particular relational data base must be definable in the relational data sub-language and storable in the catalog, not in the application programs.”Rule 11: Distribution independence. E-R diagram also termed as Entity-Relationship diagram shows relationship between various tables in the database. .
7.What is normalization? What are different type of normalization? There is set of rules that has been established to aid in the design of tables that are meant to be connected through relationships. This set of rules is known as Normalization. =>Preventing the need to restructure existing tables to accommodate new data. =>Increased speed and flexibility of queries, sorts, and summaries. For a table to be in first normal form, data must be broken up into the smallest un possible.In addition to breaking data up into the smallest meaningful values, tables first normal form should not contain repetitions groups of fields. The second normal form states that each field in a multiple field primary keytable must be directly related to the entire primary key. Or in other words,each non-key field should be a fact about all the fields in the primary key. A non-key field should not depend on other Non-key field. Can you explain Fourth Normal Form and Fifth Normal Form ? This entry was posted in Data Base Management System, RDBMS = DBMS + REFERENTIAL INTEGRITY. A relationship is said to be in BCNF if it is already in 3NF and the left hand side of every dependency is a candidate key. A relation which is in 3NF is almost always in BCNF. These could be same situation when a 3NF relation may not be in BCNF the following conditions are found true. The candidate keys are composite. There are more than one candidate keys in the relation. The percentage of the time he spends in each department is given. 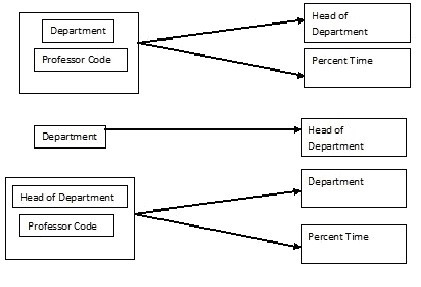 Each department has only one Head of Department. The given relation is in 3NF. Observe, however, that the names of Dept. and Head of Dept. are duplicated. Further, if Professor P2 resigns, rows 3 and 4 are deleted. We lose the information that Rao is the Head of Department of Chemistry. The normalization of the relation is done by creating a new relation for Dept. and Head of Dept. and deleting Head of Dept. form the given relation. The normalized relations are shown in the following. See the dependency diagrams for these new relations. This entry was posted in Data Base Management System, DataBase Management System, DBMS, F.Y.B.Sc. (IT), Programming in Java and tagged BCNF, Boyce-Code Normal Form, Data Base Management System, DBMS, Normalization, what is BCNF ?, what is Normalization ?. 1.) What is the difference between a Stack and an Array? Stack is a dynamic object whose size is constantly changing as items are pushed and popped. Stack may contain different data types. Stack is declared as a structure containing an array to hold the element of the stack, and an integer to indicate the current stack top within the array. Stack is a ordered collection of items. Array is an ordered collection of items. Array is a static object. It contains same data types. Array can be home of a stack i.e. array can be declared large enough for maximum size of the stack. 2. What is sequential search? In sequential search each item in the array is compared with the item being searched until a match occurs. It is applicable to a table organized either as an array or as a linked list. 3. What are the disadvantages array implementations of linked list? The no of nodes needed can’t be predicted when the program is written. The no of nodes declared must remain allocated throughout its execution. In linear list the next field of the last node contain a null pointer, when a next field in the last node contain a pointer back to the first node it is called circular list. 5. What does abstract Data Type Mean? Data type is a collection of values and a set of operations on these values. Abstract data type refers to the mathematical concept that defines the data type. 6. Define double linked list? An info field that contains the information stored in the node. Left field that contain pointer to node on left side. Right field that contain pointer to node on right side. 7. What are the methods available in storing sequential files? This entry was posted in Data Base Management System and tagged 1.) What is the difference between a Stack and an Array, a null pointer, Abstract data, Array, Array can be home of a stack, Array is a static object, • Distribution of Initial runs, • Left field that contain pointer, • Right field that contain pointer, circular list, collection of data elements called nodes, current stack top, data structures, Data type, Define circular list, Define double linked listm, FYBCA STUDENTS, Interview questions of Data structures in C, It contains same data types,  Array is an ordered collection,  Stack is a dynamic object,  Stack is a ordered collection,  Stack may contain different data types, linear list, Linked List, methods available in storing sequential files, Natural merging, Polyphase sort, sequential search, Stack, Straight merging, the disadvantages array implementations of linked list, The no of nodes needed, USEFUL FOR FYBSC (IT), What does abstract Data Type Mean, What is sequential search. One of the main advantages of using a database system is that the organization can exert, via the DBA, centralized management and control over the data. The database administrator is the focus of the centralized control. Any application requiring a change in the structure of a data record requires an arrangement with the DBA, who makes the necessary modifications. Such modifications do not affect other applications or users of the record in question. Reduction of Redundancies:Centralized control of data by the DBA avoids unnecessary duplication of data and effectively reduces the total amount of data storage required. It also eliminates the extra processing necessary to trace the required data in a large mass of data. Shared Data: A database allows the sharing of data under its control by any number of application programs or users. For example, the applications for the public relations and payroll departments can share the same data. Integrity: Centralized control can also ensure that adequate checks are incorporated in the DBMS to provide data integrity .Data integrity means that the data contained in the database is both accurate and consistent. Therefore, data values being entered for the storage could be checked to ensure that they fall within a specified range and are of the correct format. Security: Data is of vital importance to an organization and may be confidential. Such confidential data must not be accessed by unauthorized persons. The DBA who has the Ultimate responsibility for the data in the DBMS can ensure that proper access procedures are followed, including proper authentication schemes for access to the DBMS and additional checks before permitting access to sensitive data. Different levels of security could be implemented for various types of data and operations. This entry was posted in Data Base Management System and tagged • Reduction of Redundancies, •Conflict Resolution, •Elimination of Inconsistencies, •Integrity, •Security, •Shared Data, centralized control, critical applications, Data Base Management System, Data integrity, DBMS, DBMS and its Advantages, eliminates the extra processing, main advantages of using a database system.